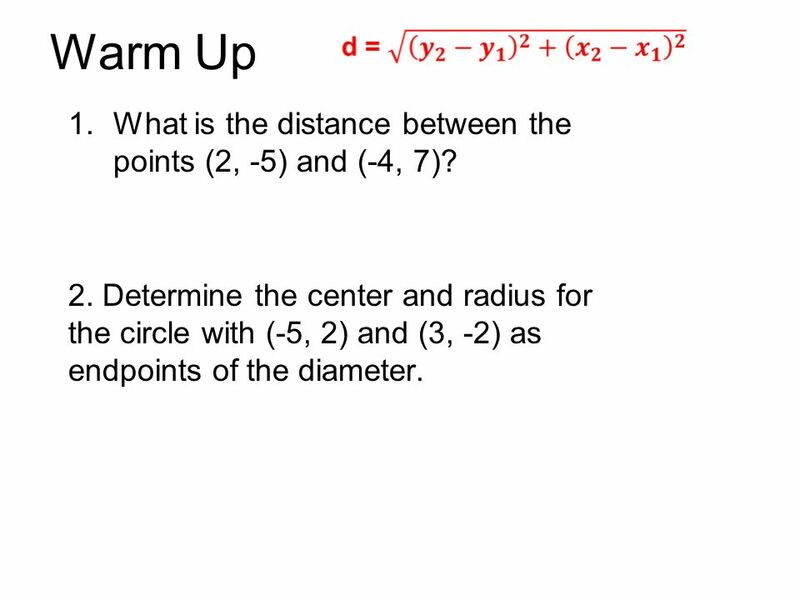 Warm Up 1.What is the distance between the points (2, -5) and (-4, 7)? 2. Determine the center and radius for the circle with (-5, 2) and (3, -2) as endpoints. 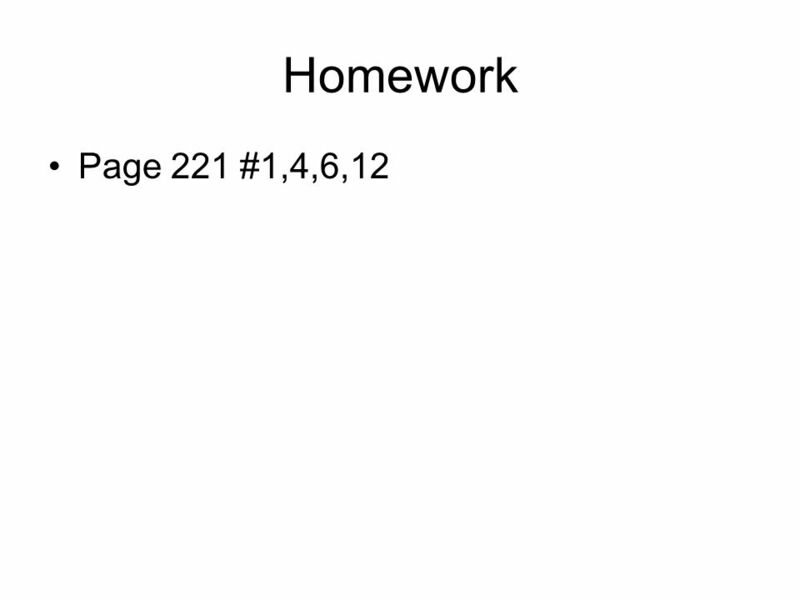 1 Warm Up 1.What is the distance between the points (2, -5) and (-4, 7)? 2. Determine the center and radius for the circle with (-5, 2) and (3, -2) as endpoints of the diameter. 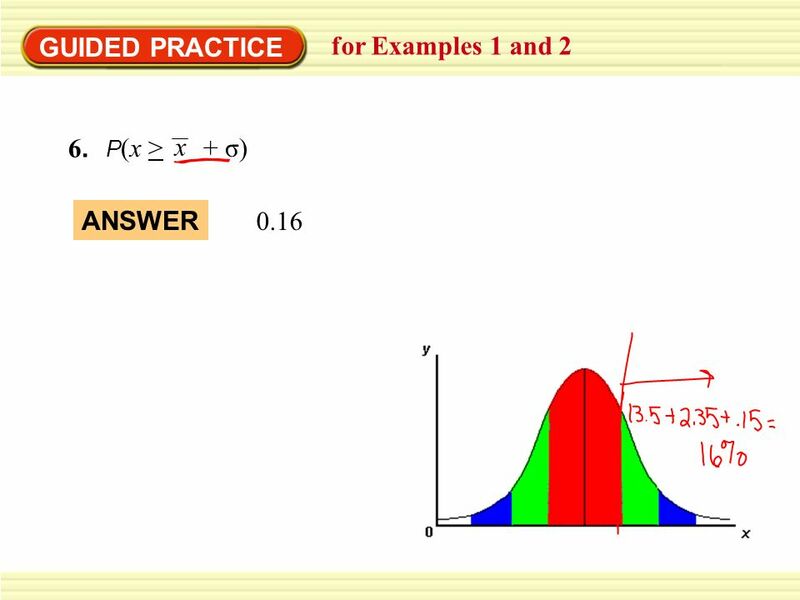 3 Total area under curve equals 1. Why? 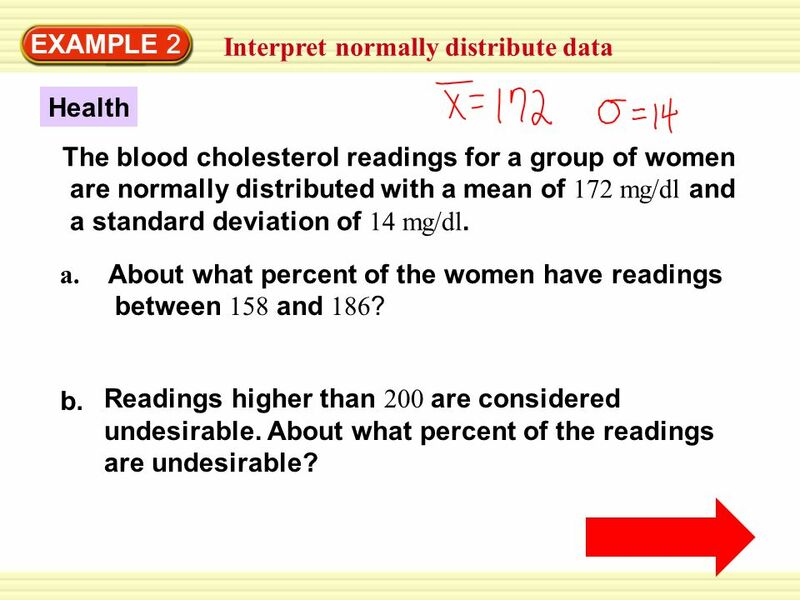 12 EXAMPLE 2 Interpret normally distribute data Health The blood cholesterol readings for a group of women are normally distributed with a mean of 172 mg/dl and a standard deviation of 14 mg/dl. a. About what percent of the women have readings between 158 and 186 ? 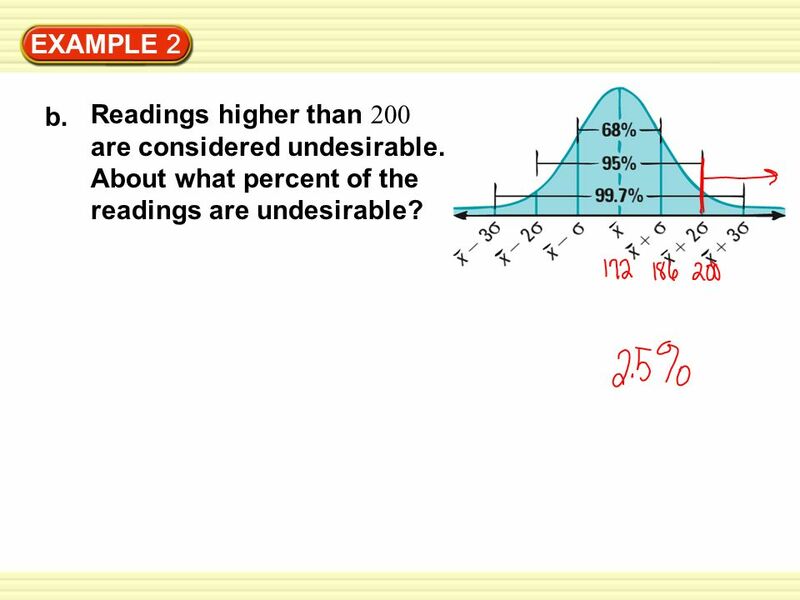 Readings higher than 200 are considered undesirable. About what percent of the readings are undesirable? b. 13 EXAMPLE 2 a. About what percent of the women have readings between 158 and 186 ? 14 EXAMPLE 2 Readings higher than 200 are considered undesirable. About what percent of the readings are undesirable? b. 15 GUIDED PRACTICE for Examples 1 and 2 7.7. WHAT IF? 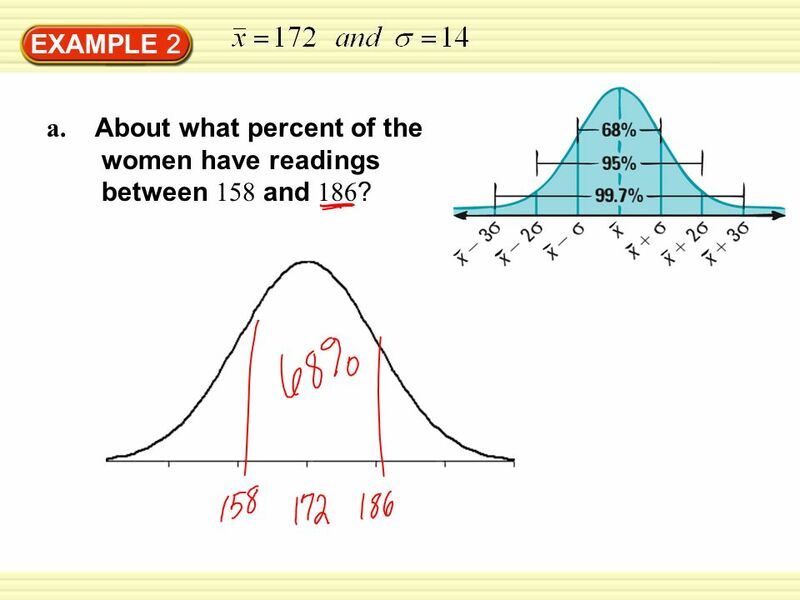 In Example 2, what percent of the women have readings between 172 and 200 ? 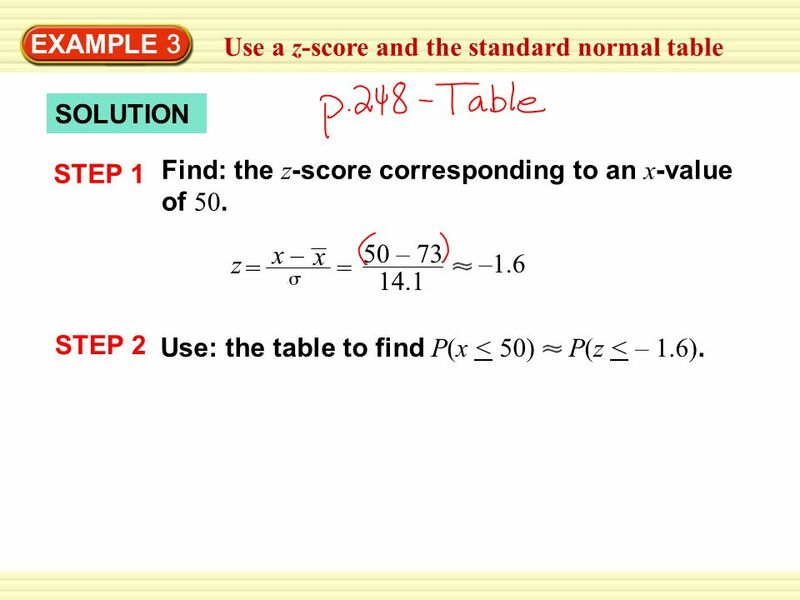 18 EXAMPLE 3 Use a z-score and the standard normal table SOLUTION STEP 1 Find: the z -score corresponding to an x -value of 50. 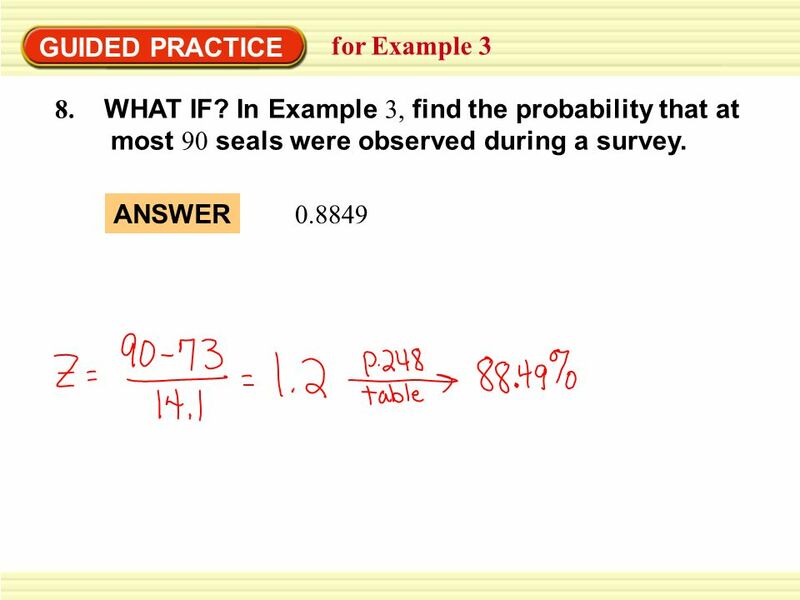 –1.6 z = x – x 50 – 73 14.1 = STEP 2 Use: the table to find P(x < 50) P(z < – 1.6). 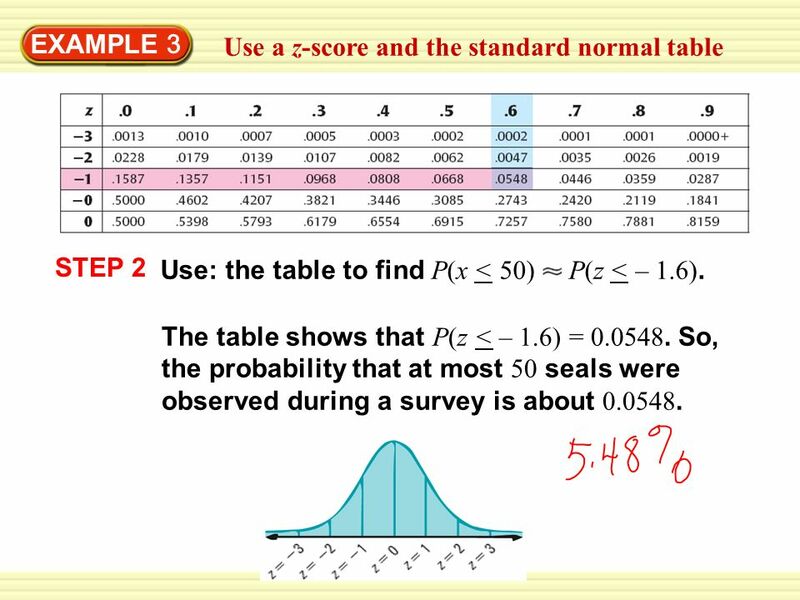 19 EXAMPLE 3 Use a z-score and the standard normal table STEP 2 Use: the table to find P(x < 50) P(z < – 1.6). 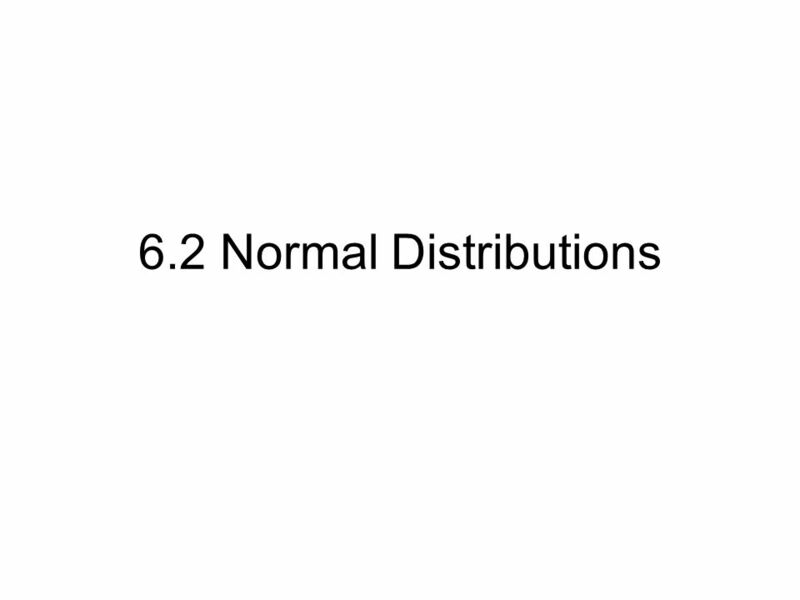 The table shows that P(z < – 1.6) = 0.0548. 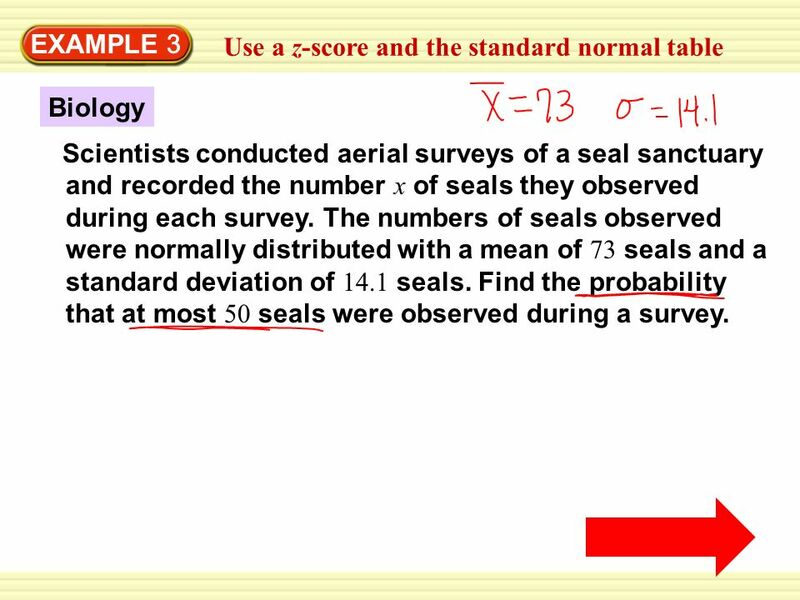 So, the probability that at most 50 seals were observed during a survey is about 0.0548. 21 GUIDED PRACTICE for Example 3 9. 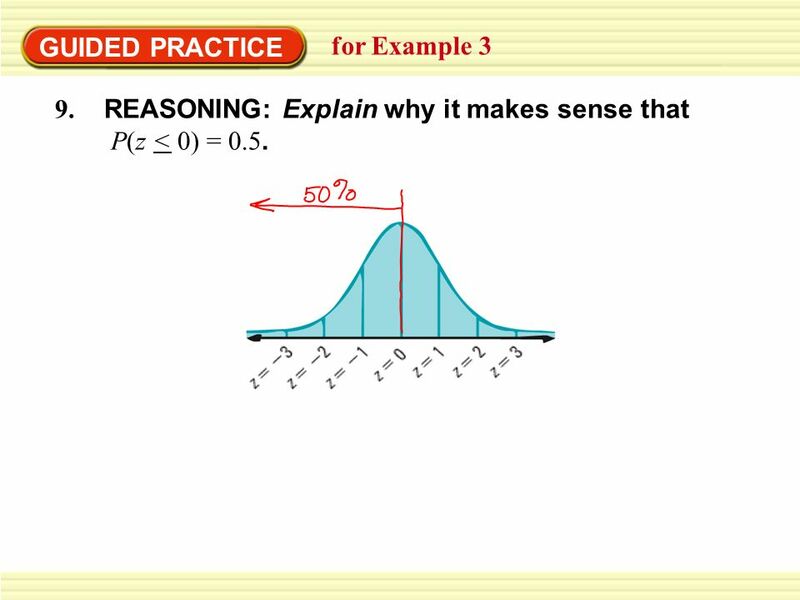 REASONING: Explain why it makes sense that P(z < 0) = 0.5. 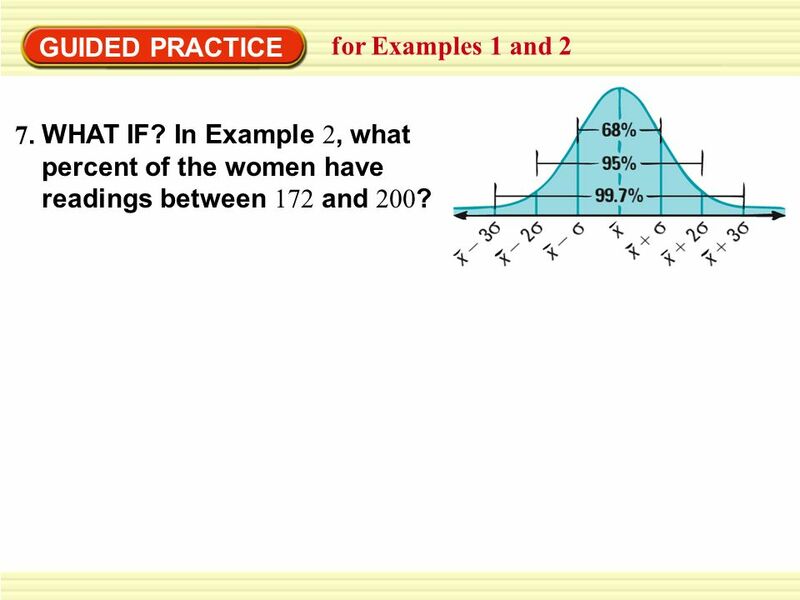 23 For use after Lesson 6.2 0.025 ANSWER 2. The average donation during a fund drive was $75. The donations were normally distributed with a standard deviation of $15. 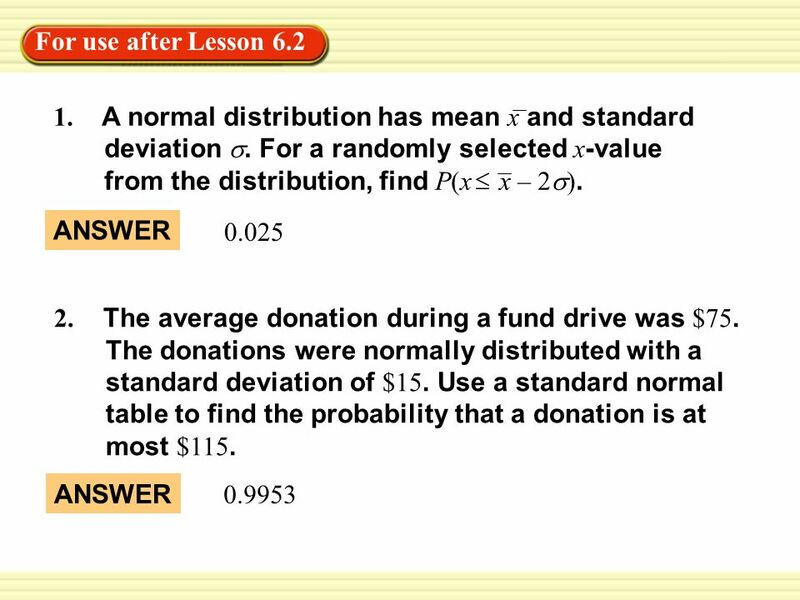 Use a standard normal table to find the probability that a donation is at most $115. ANSWER 0.9953 1. 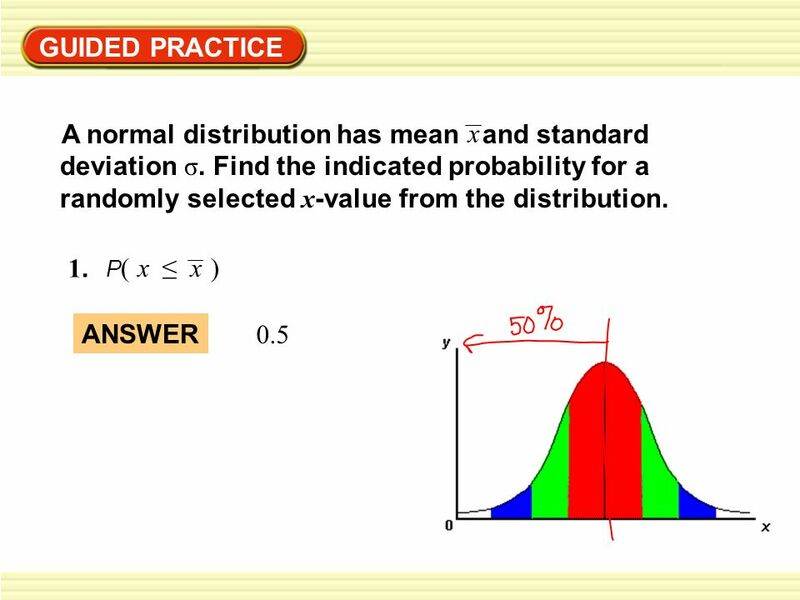 A normal distribution has mean x and standard deviation. For a randomly selected x -value from the distribution, find P(x x – 2 ). Download ppt "Warm Up 1.What is the distance between the points (2, -5) and (-4, 7)? 2. Determine the center and radius for the circle with (-5, 2) and (3, -2) as endpoints." 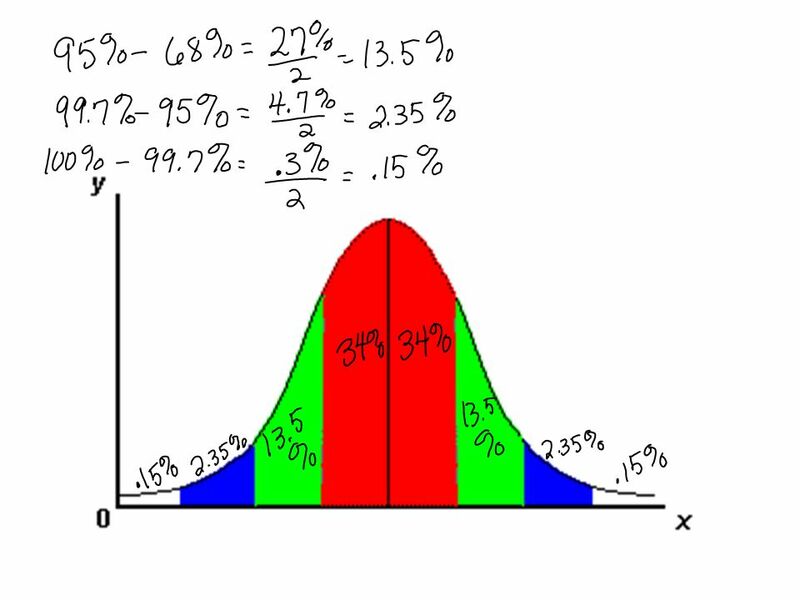 Chapter 5 Some Key Ingredients for Inferential Statistics: The Normal Curve, Probability, and Population Versus Sample. 60, 70, 78, 88, 88, 88, 93, 96 ________ Med = ___________ Mode = _________ Range = _________ __________ Warm-up. 1 Session 8 Tests of Hypotheses. 2 By the end of this session, you will be able to set up, conduct and interpret results from a test of hypothesis concerning. 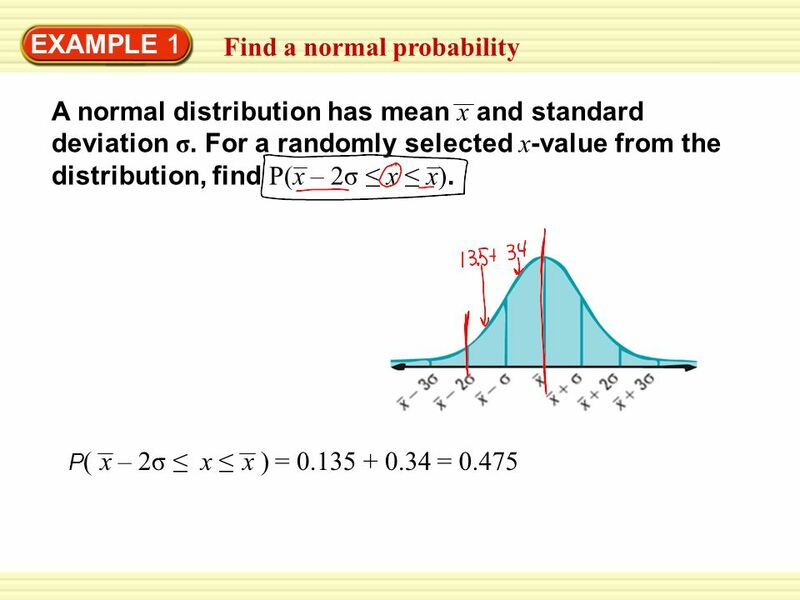 Normal Distribution 2 To be able to transform a normal distribution into Z and use tables To be able to use normal tables to find and To use the normal. 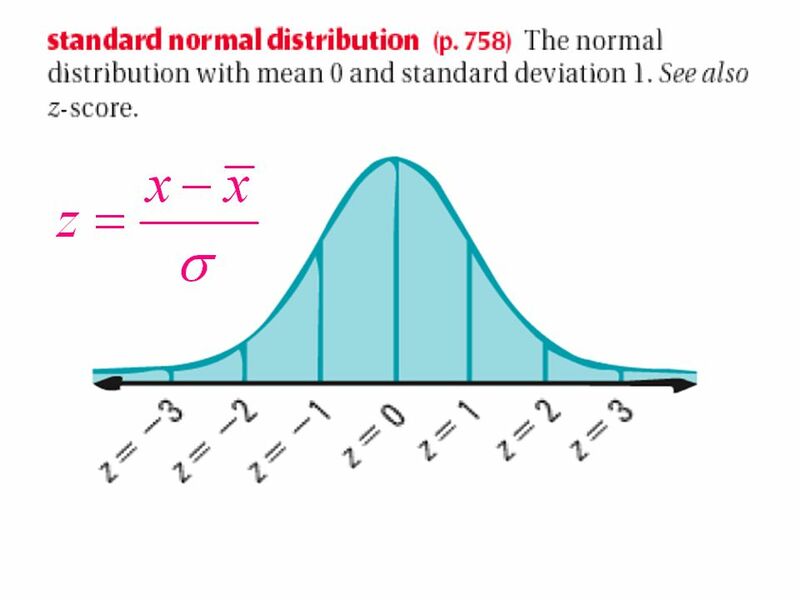 Finding Z – scores & Normal Distribution Using the Standard Normal Distribution Week 9 Chapter’s 5.1, 5.2, 5.3. 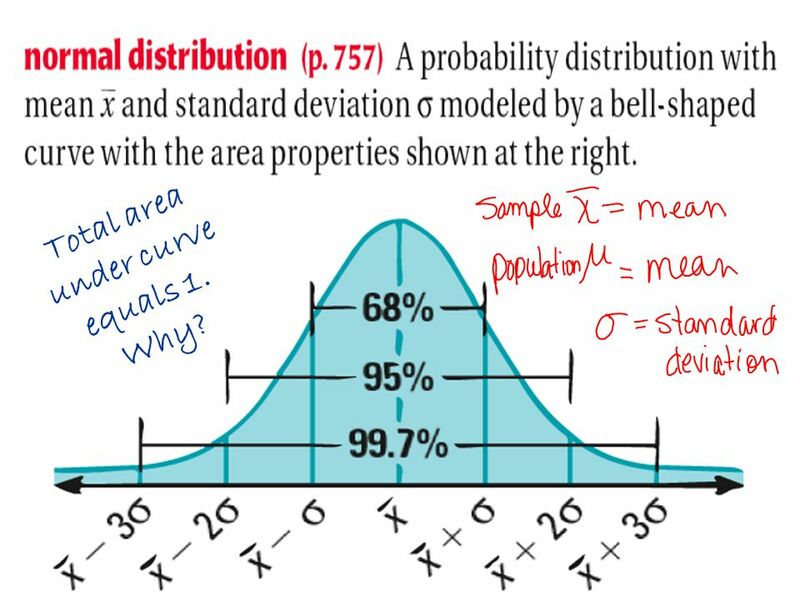 MATH IV 2 ND 9 WEEKS DAILY WARM UPS Oct 14 th – Oct 31 st.
Unit 4 – Probability and Statistics Section 12.7 Day 10.